The mild improvement in the international environment has helped to uplift the mood among the CESEE exporters. 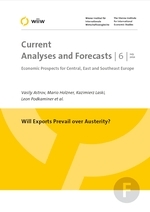 In 2010, exports are likely to be the main growth driver throughout the region, in many cases contributing to an improvement in external balances. The latest data reveal a return to about 80 - 90% of pre-crisis export levels. Transport equipment, metals, energy products, chemicals, machinery and equipment are currently among the region's most successful export goods. Countries with flexible exchange rate regimes and a stronger industrial base appear to be benefiting most from the current international trade rebound. They are expected to record growth above the regional average (yet still below pre-crisis levels). The previously overheated growth rates in excess of 7% on regional average in 2007 were followed by a severe cooling-down to some 3.5% in 2008 and a steep drop to no less than -6% in 2009. We expect a minor rebound in the order of 1% for the year 2010. In a rather optimistic scenario, our average forecasts predict a pick-up of growth to about 2.5% in 2011 and approximately 3.5% in 2012 (see Table). Growth is mostly driven by exports and regained competitiveness. In subsequent years, investment and household consumption will gradually pick up. In most countries of the region, previously postponed investments will be finally put into effect and household consumption will show signs of life after the crisis as well. The CIS countries are expected to register the strongest performance over the forecast period. This upswing will be mainly driven by the recovery in global commodity prices (especially for oil and steel). The Central European new EU member states have improved their external competitiveness - via devaluation and/or cuts in employment. On account of their solid industries, they profit most from the ongoing recovery in global trade. However, their growth prospects are constrained by the anaemic growth performance in their main export market - the eurozone. Prospects for recovery are weakest in the Baltic States and the countries of Southeast Europe. Their general reliance on fixed exchange rates has prevented an improvement in external competitiveness. Furthermore, their weak industrial sectors remain an obstacle to export-led growth. Most CESEE countries have been recently shedding labour and unemployment is on the rise - a belated consequence of the crisis. In the Western Balkans, significant employment cuts have so far been mostly averted, but they might well come to the fore in the near future. Labour market deterioration - in tandem with the ongoing 'credit crunch' and austerity measures - is suppressing consumer demand almost everywhere (except in the CIS and Turkey). The recent surge in CESEE budget deficits reflects primarily the recession-induced shortfalls in tax revenues rather than a rise in expenditures. However, funding deficits under the current conditions is becoming costlier. The fiscal consolidation measures being envisaged might well increase the drag on domestic demand (first and foremost in the NMS). A permanent tightening of financial conditions and a sustained need for deleveraging will most likely result in slower capital accumulation in the years ahead. Furthermore, as a consequence of the crisis, persistently low employment levels might result in human capital losses. The slower growth will also have an impact on the region's long-term prospects of convergence. As a result of the crisis, the average CESEE country might lose close to a decade in the process of income catching-up. The CEE economies are adjusting to the effects of the crisis in the West. Those adjustments are slowing down economic growth and suppressing the speed of convergence. Unless the 'old' EU starts growing faster than in the recent past, the long-term growth in the CEE countries will not be very spectacular either. The secular weakness of growth in the EU/euro area has its roots in the basic paradigms of EU economic policy-making. Not only does the acceleration of growth depend on changes in those paradigms, but the very preservation of the EU, which is exposed to ever stronger centrifugal forces, may also be at stake. It is in the best political and economic interests of the NMS to help avert such an eventuality, while helping to make the Union's architecture more resilient and conducive to faster growth. One issue relates to the way in which monetary policy has been defined and pursued in the euro area. It is argued that the principle 'one size fits all' on which this policy rests supports deflationary/stagnation tendencies in low-inflation/low-growth countries and bolsters booms/inflation in high-inflation/high-growth countries. Whereas Germany has fallen victim to this policy, in a number of other countries this policy fed credit and import booms. Diverging trends in unit labour costs, external competitiveness and external balances are the other side of the ECB single monetary policy. Germany has been running increasing external surpluses; its partners increasing deficits. Worse still, the German policy has supported this trend as it allegedly helps to reduce unemployment. The 'beggar-thy-neighbour' policy turns out to be harmful to Germany itself because it suppresses domestic demand more than it helps advance external surpluses. Weak overall growth in Germany is the result. The external surpluses mirror the spiralling debt of the external deficit countries. As that debt proves unserviceable, the German government is forced to take it over in order to save the country's financial institutions. The intensity of the centrifugal forces within the euro area (and generally in the EU) should be dampened by closer coordination of the member states' fiscal and wage policies. In particular, it may be useful to demand that growing labour productivity be matched by wages at the national level. In addition, it should be possible to institute 'excessive external surplus procedures' against countries that generate large net exports at the expense of cuts in domestic consumption. We also argue that, until the mechanisms are in place to limit the divergences in unit labour costs and external imbalances, it is advisable for the NMS to retain their own currencies and floating exchange rate regimes. The Stability and Growth Pact is also in need of modification. The 3% fiscal deficit/GDP mark may prevent the efficient operation of automatic stabilizers that today are rightly considered vital under cyclical growth slowdowns. Furthermore, the Pact's insistence that in the medium term the budgetary positions should be close to balance or in surplus is not consistent with economic reality. Attempts to observe that requirement are doomed to failure whenever the private sector's propensity to save is larger than its propensity to invest in real (fixed) productive assets. Under balanced external accounts, a permanent fiscal deficit may be a secular necessity. Problems related to rising public debt may also need to be addressed. For the euro area these problems could be rendered far less serious than is often believed.